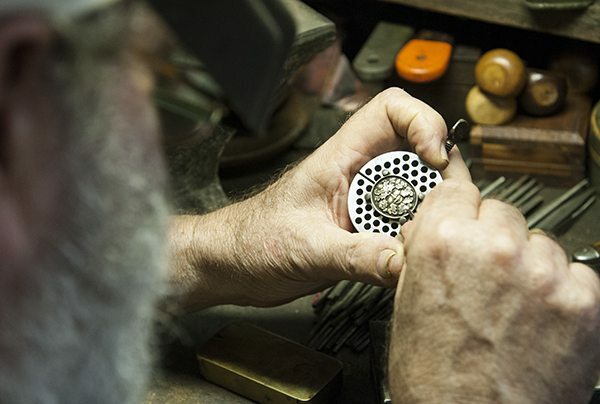 Tom Patterson has been a hand engraver and metalsmith for more than 50 years. Starting in his father’s shop at age 14, he has been a lifelong student of metals and their manipulation. Currently, Tom continues his studies from his home studio in the mountains of western NC, where he fabricates artifacts of astonishing peculiarity. 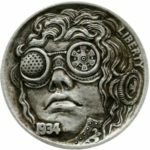 His upcoming class Hand Engraving-Hobo Nickels caught my eye as a very unique class. Unsure of what a hobo nickel is, I resisted the urge to google and decided to sit down with Tom and find out a bit more about the class. Enjoy our interview! 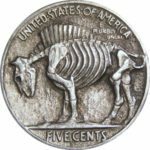 CP: What the heck is a hobo nickel? TP: It’s a modified Indian Head Buffalo nickel and the profile of the Indian or the buffalo on either side has been modified to be something else. It was commonly used by hobos during the Great Depression to increase the value of a nickel. They could trade it for a ride, buy a meal, or buy off a train cop. People started liking hobo nickels and then coin collectors start to collect hobo nickels. Some of nickels created by carvers during the Depression Era became so valuable that modern people, who had some engraving ability, began to buy nickels from coin dealers to copy and counterfeit these original hobos. The counterfeit artist would get the big bucks for their “collectable” nickel. They were discovered, and instead of being discredited, they were celebrated and collected for their own abilities. 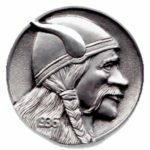 So today, even though it is definitely a niche, there are a lot of hobo nickel carvers. One of the famous carvers, he had this little kit, or box, of his handmade tools, and it went to auction a few years back and it sold for $9000. The old original nickels are worth thousands of dollars now and some of the new nickels are worth a lot of money too. CP: I thought hobo were just lazy bums, how did they get so good at carving? or engraving? TP: It’s both carving and engraving. You can do very intricate things with the right tools and you can do very crude things with just a pocket knife. A lot of the original hobo nickel artists were people who were out of work during the Depression. Work was down, so advertising was down. Many wood engravers did all the advertising art back then. Wood and metal engraving tools can be used on either material. To make money, engravers could reboot and sell nickels when they couldn’t sell advertising. A lot of their tools were also in pawn shops during the Depression, making them more easily available to the greater public. CP: How did you become interested in hobo nickels? TP: I was interested in hobo nickels after my main engraving gig ended. I was looking online to see what I could do with my engraving skills and I found hobo nickel. I thought it was really cool. I found the Hobo Nickel Society, which is primarily coin collectors. I bought some nickels and carved them. I actually had already done a similar thing in the 60s in the Army. I would redo Franklin Delano Roosevelt dimes into Lyndon B. Johnson dimes. I could take FDR’s profile and change it into LBJ in about 15 minutes. I could get a buck for that dime. It was a good way to have extra beer money. So, effectively, I had already done “hobo nickels” without knowing about the art of hobo nickels from the Depression Era. CP: When was the Buffalo/Indian Head Nickel in circulation? CP: How do you get them now? TP: There’s millions of them. It’s not hard to find them; they are not a valuable coin. I could probably buy a roll in Murphy at the flea market for like $20. CP: So what sort of face and motifs are carved into hobo nickels? TP: Well, I put hobos on them. A lot of carvers they would put Kaiser Wilhelm or Jewish pawn dealer caricatures (anti-Semitic images were popular in the 30s). Soldiers did it before the Depression Era. During WWI, GIs would do it when they were sitting at Fort Dicks waiting to ship out, so there would be pockets of hobo nickels in New York and New Jersey just from the sailors and the soldiers. Today the motif could be anything… Harley Davidson’s to skulls to fictional characters to whatever. The internet is full of examples of hobo nickels. 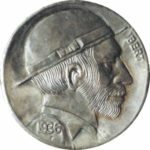 (Note from Cory: I highly recommend checking out the hobo nickel Google image search to see the vast diversity of contemporary hobo nickels. It is impressive and inspiring.). I get lost in creating a character. I start by bringing the profile out until it has some life. I put way to much time into them. It’s a place to put my head and my mind goes blank. CP: So it’s like meditative? TP: Engraving is like that for me especially now that I am not working commercially. Tom works on a green man motif on a silver brooch. Not a hobo nickel, but an impressive example of engraving! CP: How did you start engraving? TP: My father was an engraver. When I was 14, I had a paper route and I was good at it. I could put those papers right on the porch. My dad says: “Well, you could make more money if you learned to engrave and came down to work at the shop in the afternoon.” I really had to think about it because that was an inside thing, in a windowless room. I thought that the paperboy thing had much more prestige. I was my own man! I’m out there rolling my own papers, riding around the neighborhood, collecting money. That was the life, but in the end, I went for the big bucks and started engraving for my father. All through junior high school and high school, I would head to my dad’s shop after school and work as an engraver and jeweler for my father. When I went in the army, I took my engraving tools with me so I could continue to make a little extra money on the side. I did a lot of insignias on people’s belt buckles and cigarette lighters. That is when I started to make LBJ dimes too. 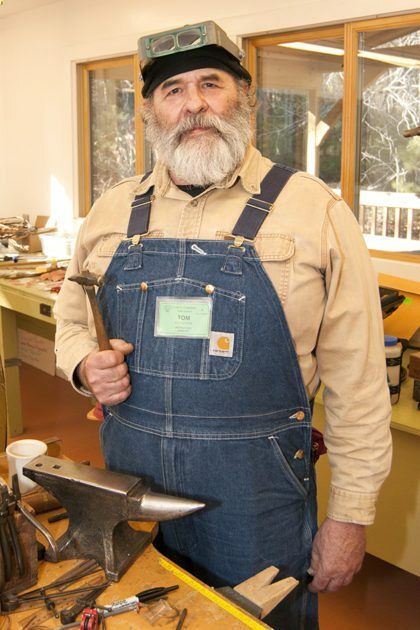 Tom Patterson in the Folk School Jewelry Studio. CP: What are common metals used for engraving? TP: For jewelry and ornaments, copper, silver, and gold are all really good soft metals for engraving. As an engraving medium, copper is right there at the top for me, not too soft, not to hard. It’s also ideal for printmaking. Copperplate printmaking is my favorite kind of printmaking. CP: Do people still work as engravers? TP: There are a few hand engravers left, but most of them are mechanized and use machines. The true hand engraving, where you just use the chisels that you push with your hand, well, there’s not many people who do it anymore. It’s very time consuming to learn how to do it. You have to have the desire to do it and it is not lucrative. If you are going to be making money as an engraver, you need the power equipment. Once I bought the power equipment, my wages doubled right away, but I had no finesse with it. I need to use the hand tools to really finesse everything. I don’t like the feel of the power tool. I don’t like the noise, or the vibration, or the hand piece. I feel less connected when I have the machine between me and the metal. With hand tools, I’m feeling the edge of the metal. I don’t get that with the power tools. TP: For engraving, I was always inspired by firearm engravings. Those engravings are really the epitome of the best work that was out there. They had alot of relief work and good design with motifs like animals, scrolls, leaves, etc. I was really attracted to that. Letters were what we primarily did in the jewelry store: monograms, insignias, and signet rings. That wasn’t particularly inspiring, but I do like lettering and layout. Among the Great Depression’s traveling men, there were a few individuals with the skill to alter the image on an Indian-head nickel in a variety of ways with simple tools, rendering it of greater value as a curiosity and barter item than it had as legal tender. 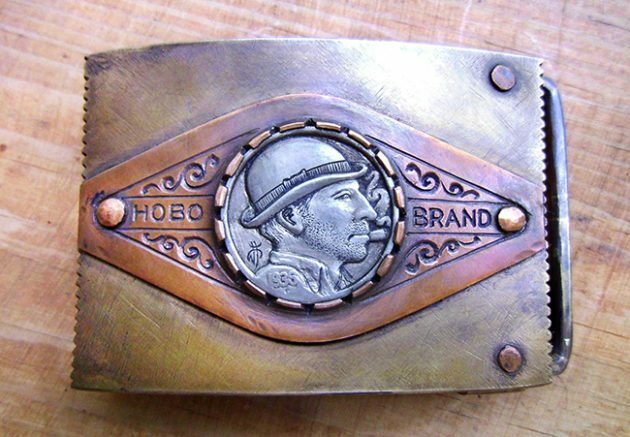 Learn the basics of hand engraving while celebrating the resourcefulness of the American hobo. Use conventional hand-engraving tools and equipment, as well as improvised tools made from commonly available, found materials. No experience required. Register today! 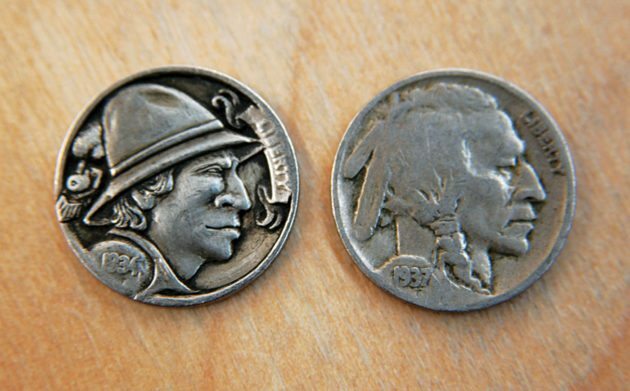 An altered Indian-head nickel (left) by Tom Patterson and an original Indian head (right). Photo by Tom Keran.